Updated 3:45 p.m. - Mitt Romney paid an effective tax rate of about 14 percent last year, his campaign said Friday while also announcing that the Republican presidential nominee had paid an average annual effective tax rate of about 20.2 percent between 1990 and 2009. The Daily Rundown's Chuck Todd talks about the "hectic" week that was for Mitt Romney and their efforts to shift the focus back to President Barack Obama. Romney made good on his pledge to release his tax returns from 2011 before the election, and went a step further than was previously anticipated in releasing a certified summary of his tax returns over a two-decade period preceding 2010. The Republican's campaign said Romney paid more than $1.9 million in taxes on income of about $13.7 million. That amounts to a 14.1 percent effective tax rate; the tax level is lower because most of the Romneys' income comes from investment, which is taxed at a lower rate than employment income. Mitt and Ann Romney also donated about $4 million -- about 30 percent of their income -- to charity in 2011, though they only claimed a deduction of about $2.25 million from those donations, according to the campaign. That means the Romneys voluntarily paid a higher tax rate than they were legally required, which the campaign said they did in order to stay consistent with Romney's pledge to never play less than a 13 percent tax rate. "He has been clear that no American need pay more than he or she owes under the law," said spokeswoman Michele Davis. "At the same time, he was in the unique position of having made a commitment to the public that his tax rate would be above 13 percent. He directed his preparers to ensure that he is consistent with that statement." Republican presidential candidate and former Massachusetts Gov. 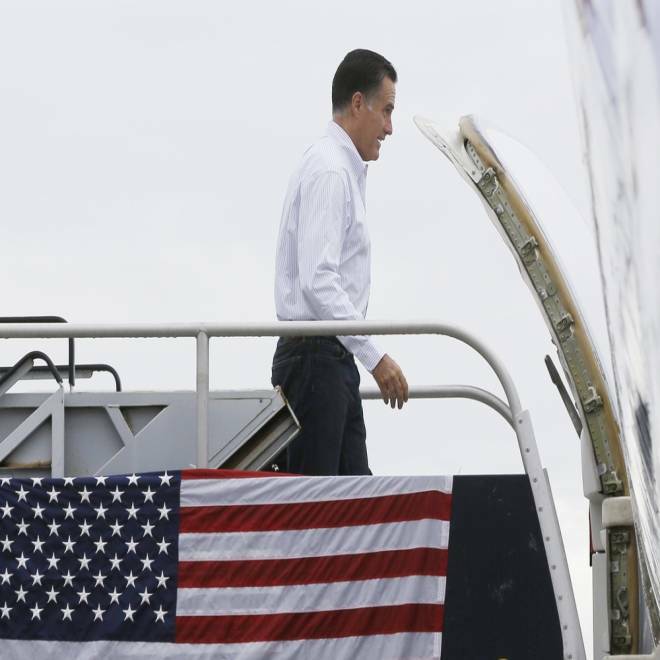 Mitt Romney boards his campaign charter plane in West Palm Beach, Fla., Friday, Sept. 21, 2012. The release of these documents add greater insight into Romney's immense personal fortune, but also looks to defuse criticism of Romney associated with his personal finances. President Barack Obama and an array of Democrats have launched attacks on Romney, looking to turn him into the most prominent example of how wealthy Americans are able to use tax deductions and complex financial instruments to end up paying a lower effective tax rate than most Americans. Senate Majority Leader Harry Reid -- a Democrat from Nevada, where Romney is coincidentally campaigning today -- went far further than that in making a repeated public allegation earlier this year that an anonymous source had told him that there were years in which Romney paid no taxes. The Daily Rundown's Chuck Todd talks to David Axelrod, President Obama's chief campaign advisor, about the latest with the Obama campaign. Throughout the summer, Democrats pummeled Romney over the issue of taxes as the Republican doggedly refused to release more than the 2010 and 2011 returns. (Last year's returns were delayed after the Romneys requested an extension on their filing.) Those attacks, which reprised much of the criticism of Romney leveled by fellow Republicans during the GOP presidential primary earlier this year, played a large role in negatively defining Romney, especially in swing states. Friday's release of a notarized summary of the Romneys' taxes from 1990-2009 represents a stride toward undercutting that criticism, though, for Republicans, there is a high degree of fear that the damage on Romney's personal image might have already been achieved. The Romney campaign said this summary, prepared by PricewaterhouseCoopers, would show that the Romneys owed state and federal income taxes every year (in direct contradiction of Reid's claim). The letter, the campaign said, would show their average effective tax rate over that 20-year period was 20.20 percent, and there was no year in which the Romney's paid a lower effective federal personal tax rate than 13.66 percent. Moreover, the Romney's gave an average 13.45 percent of their adjusted gross income to charity each year. Adding to today's level of disclosure, the Romney also released physician letters for Romney and Ryan, which reflected both candidates' excellent state of health. It is unclear whether the release of these documents will fully quell Democratic criticism of Romney. While the Obama campaign will be able to pore over another year's worth of returns, they might not shed insight into what particular instruments the Romneys used to achieve their yearly tax rate. Democrats, for instance, have speculated that Romney might have taken advantage of offshore tax shelters in the Cayman Islands, a claim that might not be substantiated by today's release. The Romneys' low effective tax rate could threaten to renew Obama's use of the so-called "Buffett Rule" on the campaign trail. That rule represents the principle, named after billionaire Warren Buffett, that those earning more than $1 million per year should pay a minimum effective tax rate of 30 percent.